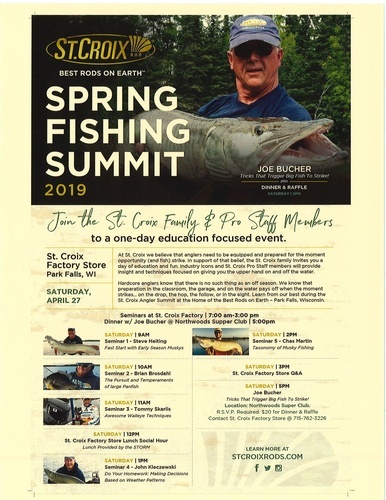 ST Croix Rods, Home of the BEST Rods on Earth will be hosting the Spring Fishing Summit at the factory store in Park Falls Wisconsin. St Croix believes that anglers need to be equipped and prepared for the moment that opportunity and fish strike. In support of that belief, the St. Croix family invites you to a day of education and fun. Industry icons and St. Croix PRO staff will provide insight and techniques focused on giving you the upper hand on and off the water.